Some say a bowl's life doesn't begin until it's broken. 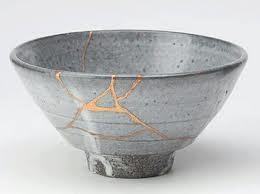 Kintsukori ( also called kintsugi) is the ancient Japanese art of putting together a broken vessel, usually a bowl, with a colorful lacquer. Colors the artist uses may be red, black or even precious metal, like gold. 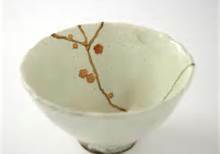 For the artist to be sucessful, the finished work must show that things are more beautiful when they are broken. The literal definition is to "repair with gold."